Dill is an herb that is suited to potted herb gardens. Keep it near the kitchen for use in many dishes, from soups and salads to breads and dips. Add at the end of cooking or use raw to preserve the most flavor. Tall and leggy, dill has feathery leaves with small clusters of yellow flowers at the top. Indoors, dill grows taller than it does outside, as it seeks out light. A very sunny window or grow lights are a necessity for indoor success. Choose 6- to 8-inch-diameter pots with a depth of 8 to 10 inches minimum. Ensure plants have plenty of drainage holes, or drill additional holes into plastic pots and place broken clay pieces over them to keep the soil from running out. Fill pots with rich potting compost. Plant anytime between October and early spring. Sow seeds ¼ inch deep into the soil. Plant one seed per pot. Keep the soil moist and warm. Dill sprouts within 2 weeks of being sown. Place the seedling in a sunny windowsill for 6 to 8 hours a day or under grow lights for 12 hours daily. 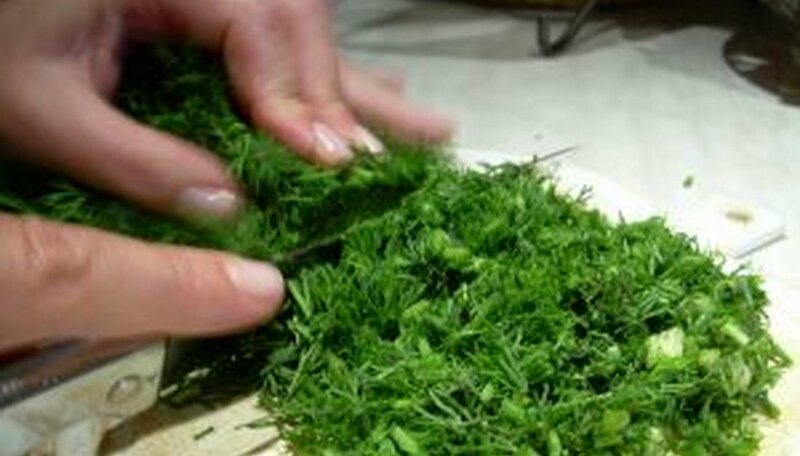 Rotate the pot to prevent the dill from leaning in one direction toward the light in a windowsill. Stake the plant once it is 10 inches high. Tie the central stem loosely to the stake with garden ties. Keep the soil moist but not soaking wet at all times. Apply a liquid fertilizer at half strength every 6 weeks. Harvest the leaves after the flowers open. Use fresh for best flavor. Move plants outdoors onto patios during nice weather to help give plenty of sunshine. Avoid over-watering, as dill is easily drowned.